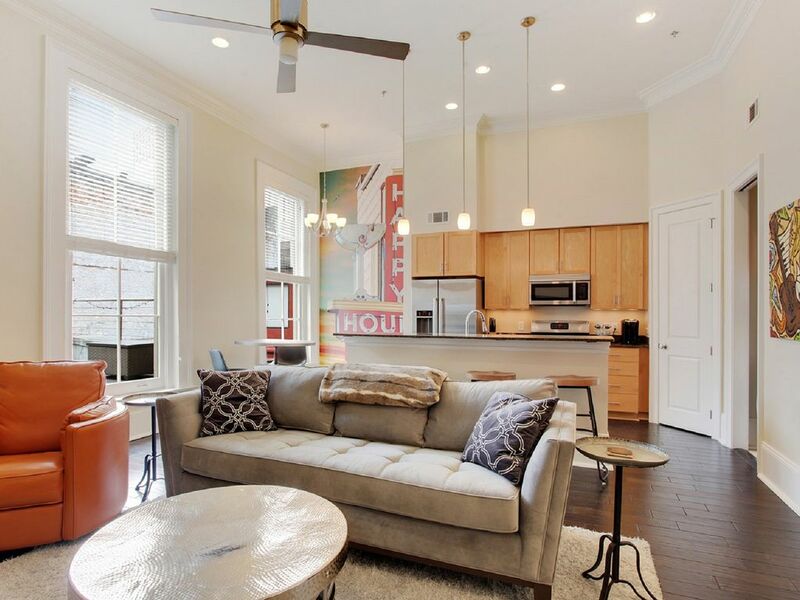 Centered two blocks from the French Quarter, minutes to the Superdome and Arena, a safe and short walk to anywhere you would want to newly furnished Luxury 1000 Sq Foot Condo allows you the feel of truly living like Mardi Gras Royalty in the Center of Downtown New Orleans. The streetcar quietly comes to an end outside the buildings entrance as you are two blocks away from the Canal St start of the French Quarter, you walk to the Casino and the Shops at Canal Place before strolling the Riverfront then hitting Bourbon Street and along down to Frenchman Street to complete your adventure. What a treat to be in the heart of New Orleans in a beautiful, modern, clean, and comfortable place. We loved the dreamy soft bed. 2 bathrooms one for each my husband and I to get ready for nights on the town. Great restaurant recommendations and easy access to everything. The balcony was a great feature so industrial and cool. We can’t say enough about how much we enjoyed this VRBO .. Nothing bad to say. Had a great start 3 blocks from bourbon street. Divinity and drug store a black away. Breakfast Cafe just outside the front door. My only concern is that too many people will know of Eric's place and my next stay won't be available. Seriously. This is the place to stay. Great location, loved the art in the house, the patio was a great spot to have a drink and soak up the sun. Great towels and bedding and plenty of coffee! Communication with the owner was easy and overall I couldn't have asked for a better experience. Stayed here for a week and loved everyday, Owner was very helpful and quick to respond to any questions. Location is walking distance to everywhere you need to go and if you don't like to walk the trolley stop is a 3 min walk away along with the city hop on hop bus. Can't wait to get bak here. Nice property. Close to transit and most places we wanted to go, yet far enough away from the crazy parts of town that the noise wasn't a bother. Great location and excellent condo! This was the perfect condo for our honeymoon in New Orleans! The location couldn’t have been better! It was close enough to all the Mardi Gras action but away enough so we could actually sleep. We were only a block away from parade routes and just a few blocks from Bourbon St. The condo was clean and had everything we needed during our stay. We loved the patio as well but didn’t get to use it much due to rain. Eric was super helpful prior to our stay as well as during our stay. One day during our stay, the WiFi/Cable went out and Eric responded right away with an update of an area wide outage. We will definitely stay here again in the future when we come back to Nee Orleans!